Unfortunately, Advantage Dog is not available for sale anymore. Please have a look at our entire fleas and ticks range for alternatives. Please note: The Advantage packaging has recently been changed. The composition of remains the same. Advantage for Dogs, featuring the active ingredient of imidacloprid, effectively prevents and protects against fleas in dogs. In 3 to 5 minutes, this product stops fleas from biting, killing adult fleas within an hour, before they can lay eggs. Any fleas present on your dog are killed within 24-48 hours of administration. A single treatment using Advantage for Dogs protects your dog against further flea infestation for 4 weeks. Advantage for Dogs can be used to treat a flea allergy/dermatitis. Reinfestation due to new fleas in the area can persist for up to six weeks or longer following the treatment. More than one treatment may therefore be needed depending on the number of fleas in the area. Advantage for Cats is available for cats. More information on this product can be found in the leaflet at the bottom of the page. 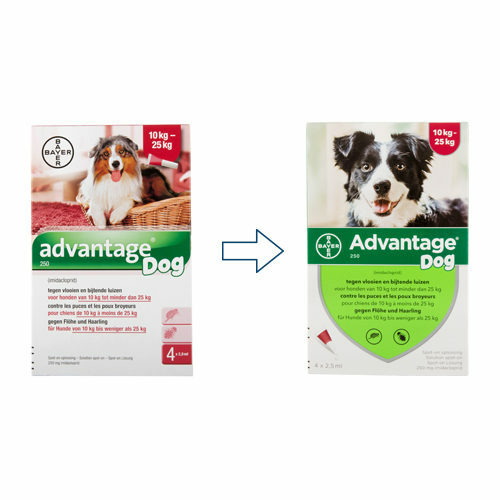 Have you used Advantage for Dogs before? Let us know what you think about this product.